Welcome, welcome! 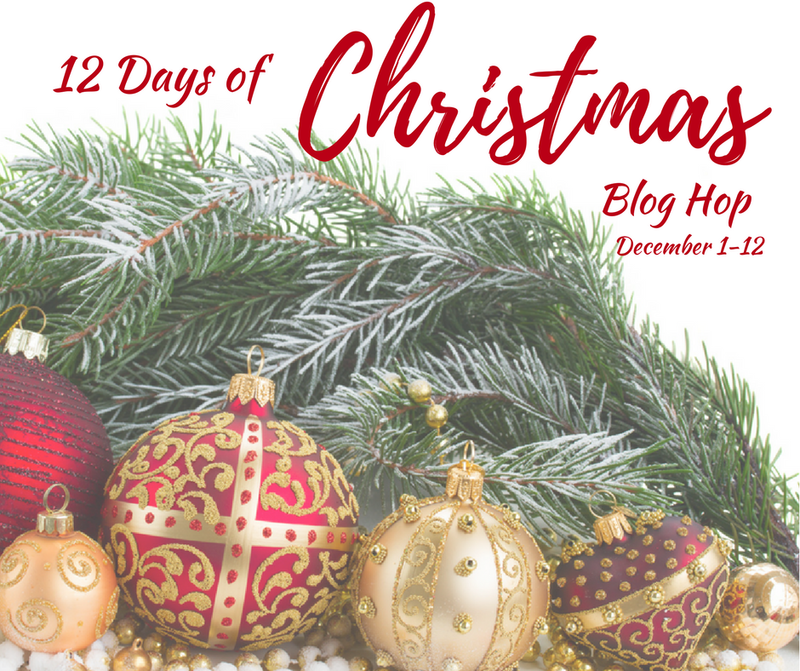 Today is day 9 of the 12 Days Of Christmas Blog Hop. 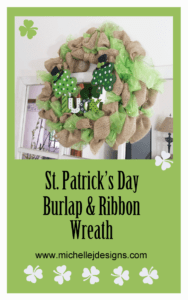 Our theme project for the 9th day is DIY wreaths. 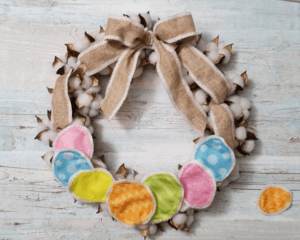 I made an Easter Wreath last year but haven’t made a Christmas wreath yet. So, this was a fun project. 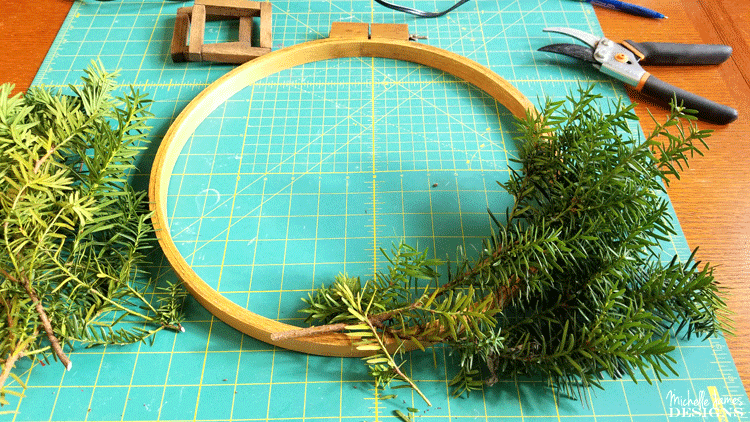 I hope you like my embroidery hoop holiday wreath. 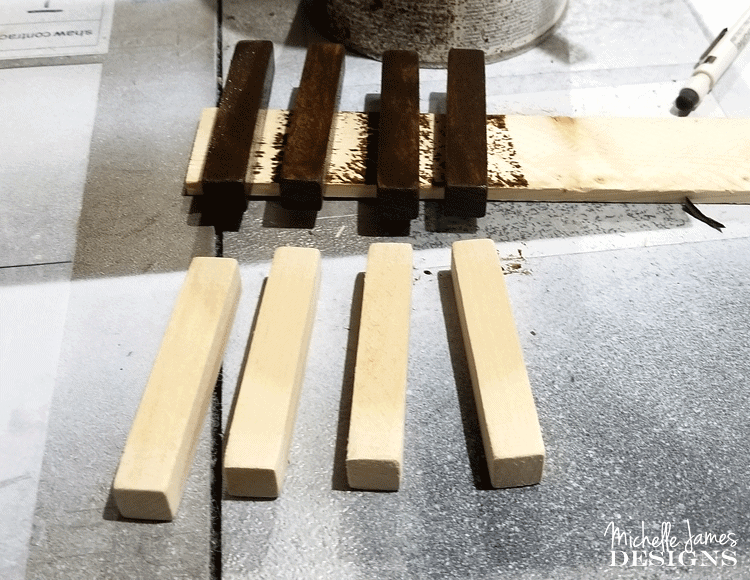 Cut 3″ pieces of wood from your scraps or from a 2ft piece of square basswood and sand and stain them using the foam brush. And stain your embroidery hoop. I just made sure it was tightly closed and stained the entire thing all at once. Add your greenery. My parents have greenery growing at their house so each year I go over and cut what I need. You could purchase some nice looking greenery too. Then you would not have to re-make your wreath each year. I started with one side and tied it onto the hoop with twine. Wire would also work but I did not have the right size. Then work on the other side. Add a bow. I made a bow using some wired ribbon. First shape the long loops and the tails then added the smaller loops on top with a tie and covered the tie with another piece of ribbon that I glued on the back. 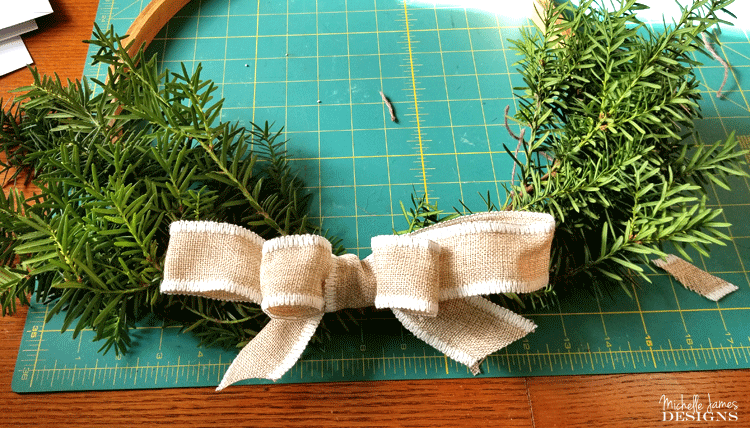 Leave the ends of the twine pretty long to tie the bow to the wreath. I did have to add just a little bit of glue as well to get it to stay put without drooping. Finish the little frames. I actually got this grand idea from Latina Next Door. 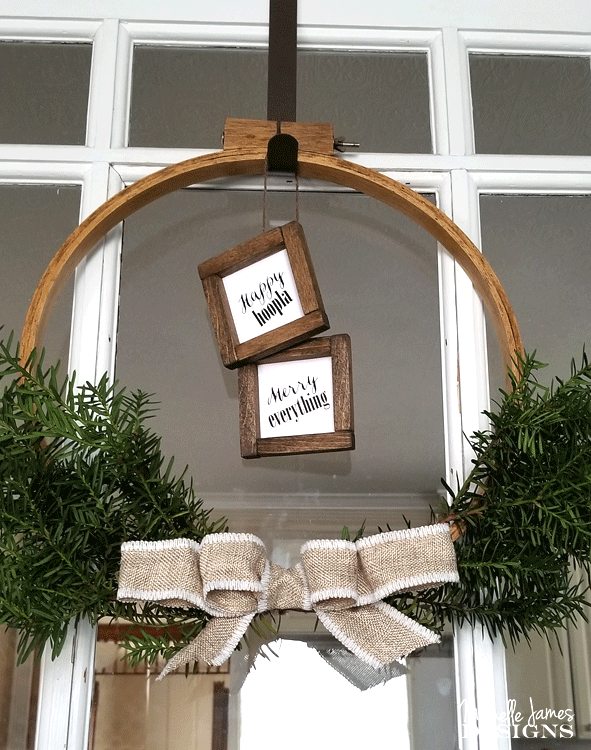 Her DIY Farmhouse Ornaments on day 1 of this blog hop were an inspiration. I used her awesome idea to finish off my wreath. And she has a good tutorial for the frames too. 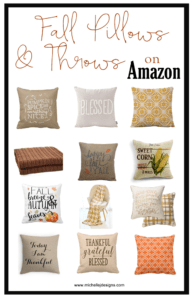 I used Photoshop Elements to create my sayings but Word or Google Docs would work. 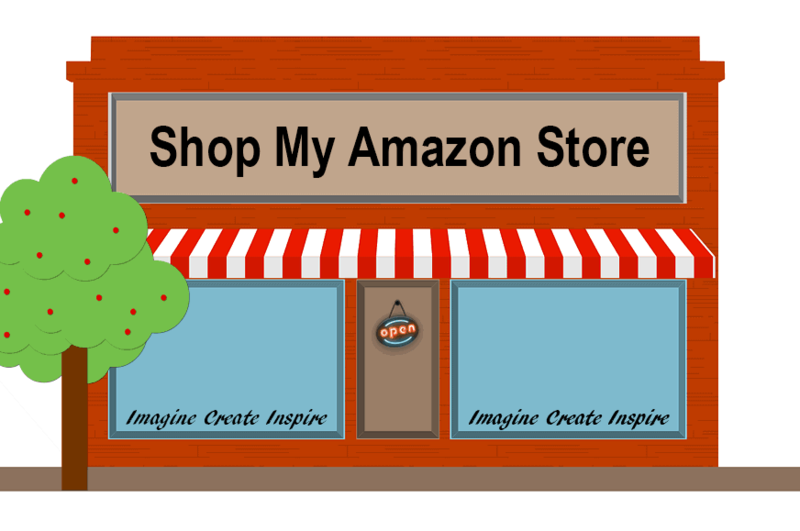 Print them onto white card stock so they are a little more stable than the printer paper. 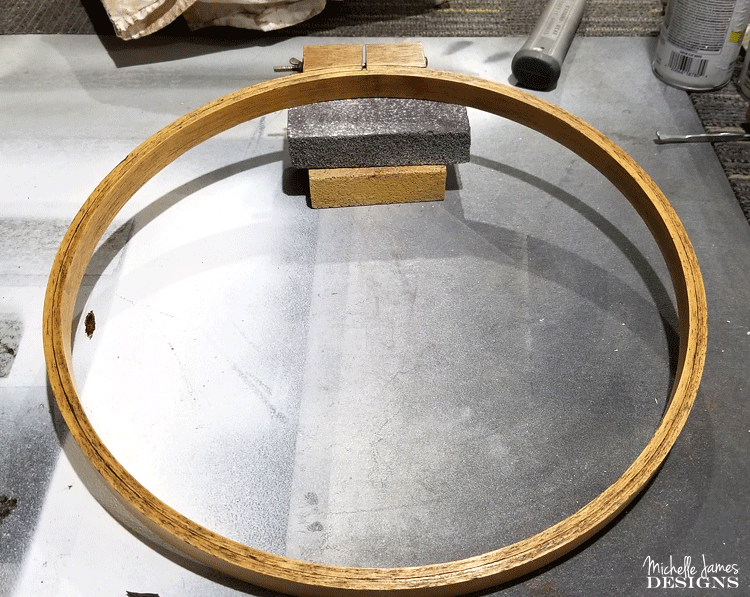 Cut a piece of twine long enough to hang the two little frames from the top of the embroidery hoop. 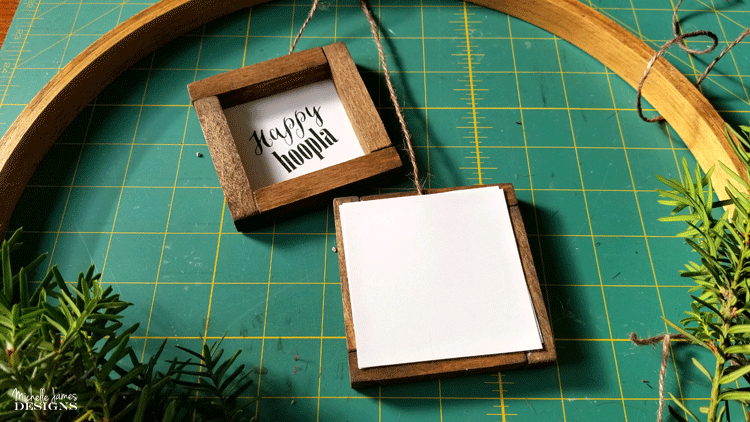 Glue your card stock piece to the back of the frame. Then use scotch tape to adhere the tie to the back of the paper. 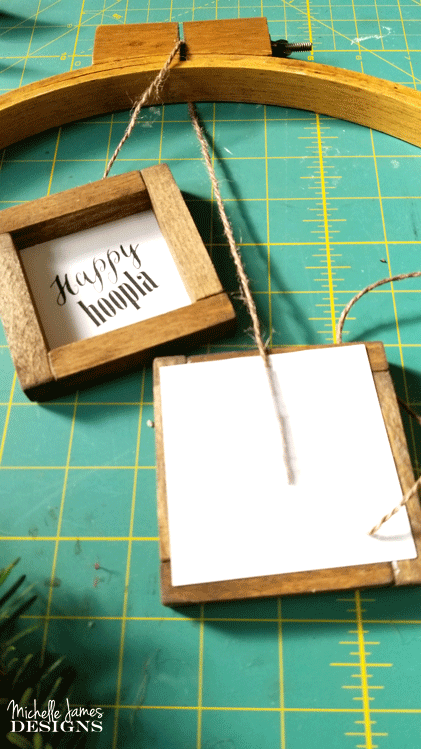 Cut another piece of card stock to place on top to hide the tape and the twine. Hang and enjoy. 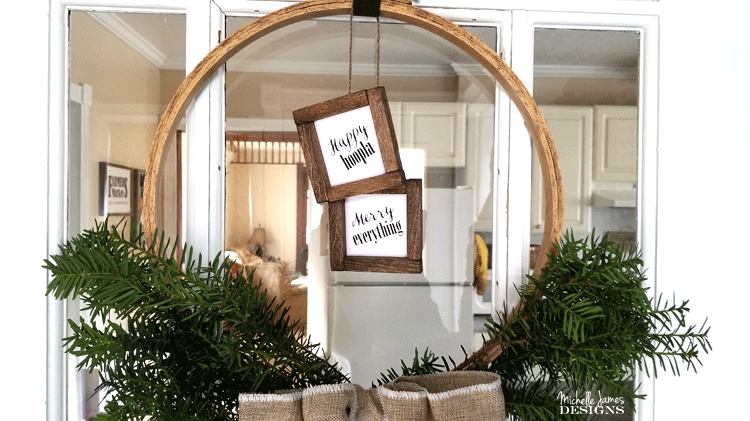 I purchased a wreath hanger at Dollar General for $1 and it works beautifully! 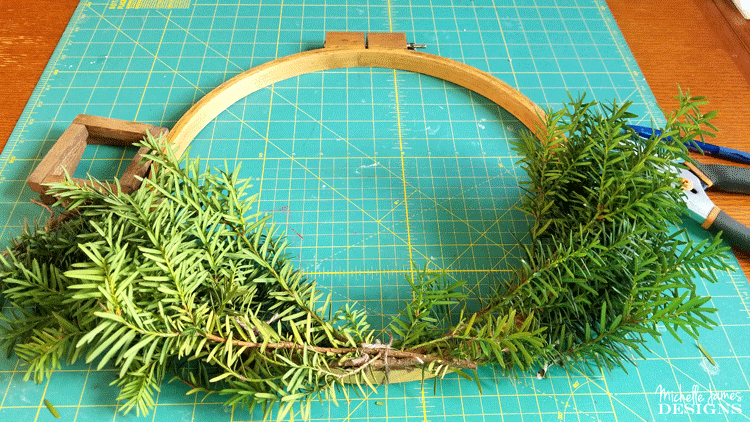 I love this embroidery hoop holiday wreath. 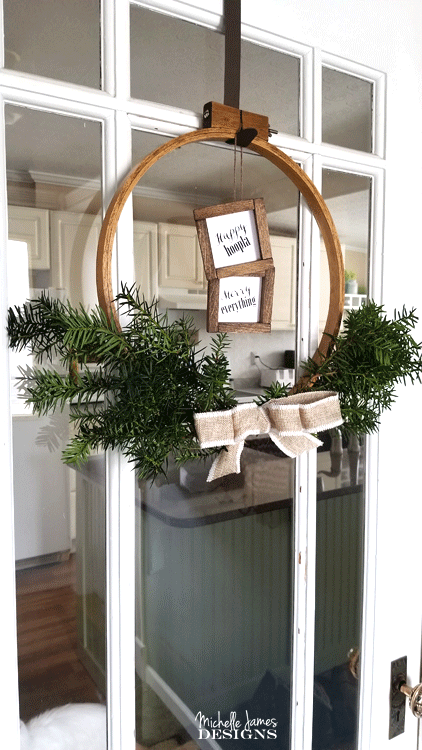 I loVe this wreath so much! The greenery looks amazing on the hoOp and the signs are perfect! Thank you Jenny! I love the hoop too. The signs made the whole thing! Such a cute idea! 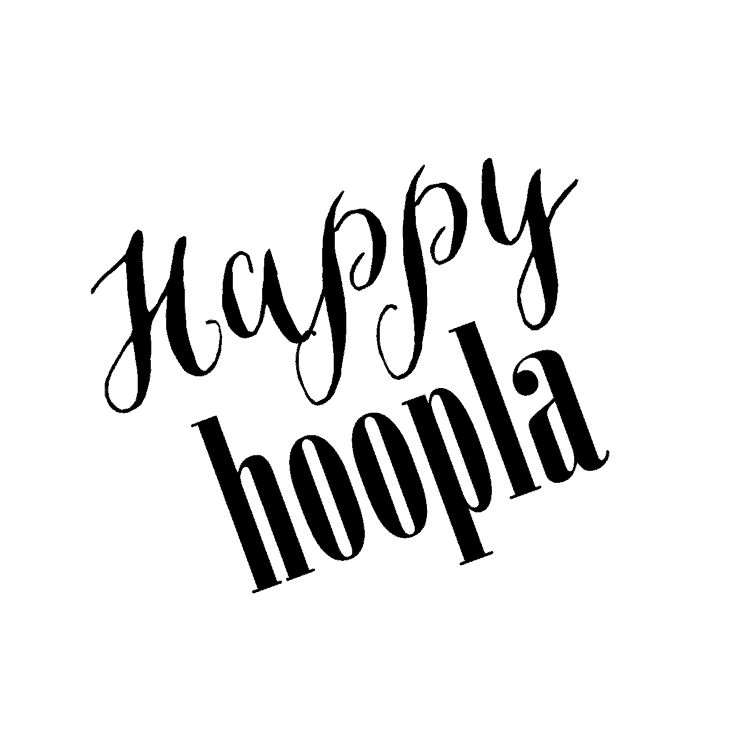 LOve the hoop and the ‘happy hoopla’ — great project! Hi Lauren! Thank you. This was a fun project. I love wreaths. Oh my goodness this is great lol. 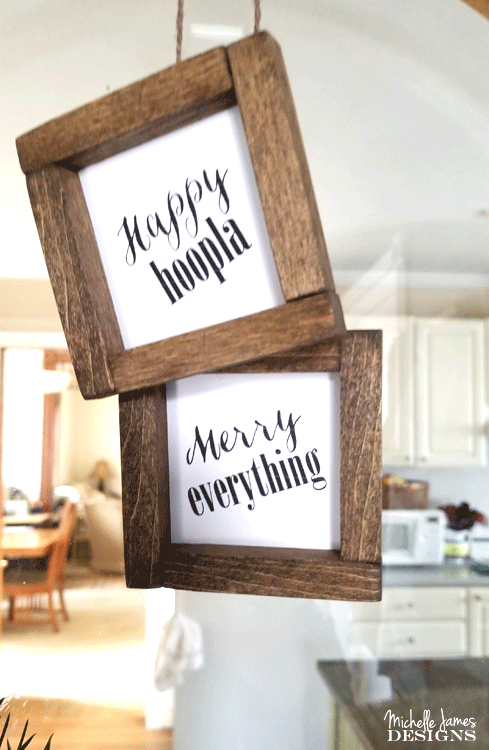 Happy Hoopla to you and your hoop wreath too lol. 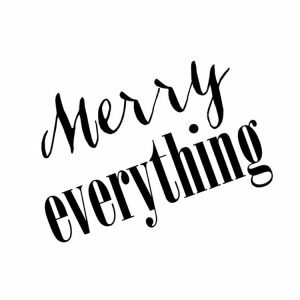 I really love how this is usable anytime of year and most certainly through the winter months. Pinning. 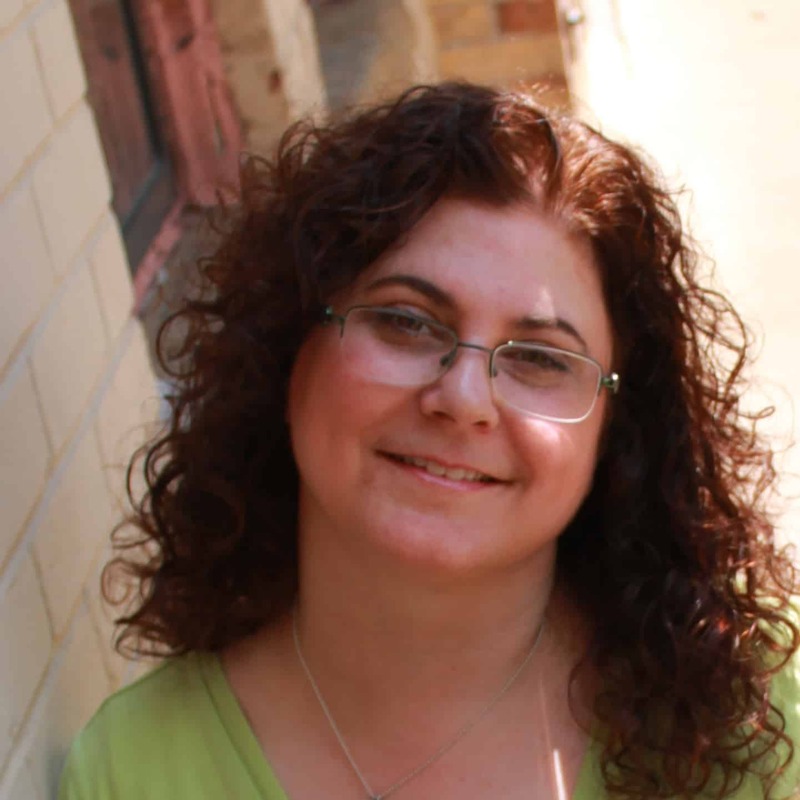 Hi Leanna! Thanks so much. It was a fun project. Love this look, Michelle. You always come up with creative ideas! So feastive and beautiful! Hi Carolann! Thanks. This wreath was fun and I love the way it looks. I may just keep it up as long as the greenery stays alive. I love this, rustic and simple. It’s perfect, I’m going to have to look for a large embroidery hoop now! Thank you. I still have this hanging up. The greenery is still holding on. When it dies I may put something springy on it and keep it up for a long time.